Pentek's Sentinel™ recorders add intelligent signal monitoring and detection for Talon real-time recording systems. The intuitive GUI allows users to monitor the entire spectrum or select a region of interest, while a selectable resolution bandwidth allows the user to trade sweep rate for a finer resolution and better dynamic range. Scan settings can be saved as profiles to allow for quick setup in the field. RF energy in each band of the scan is detected and presented in a waterfall display. Any RF band can be selected for real-time monitoring or recording. In addition to manually selecting a band for recording, a recording can be automatically started by configuring signal strength threshold levels to trigger a recording. 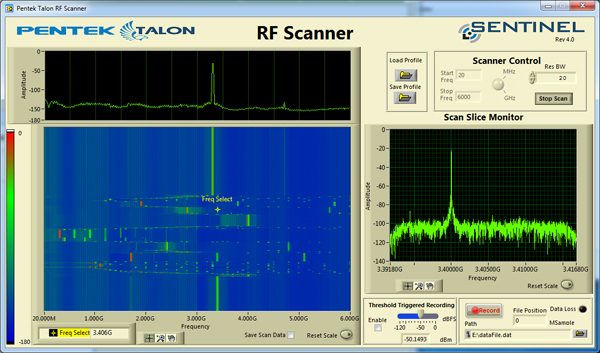 The Sentinel hardware resources are controlled through enhancements to Talon's SystemFlow® software package that includes a Virtual Oscilloscope, Virtual Spectrum Analyzer and Spectrogram displays, providing a complete suite of analysis tools to compliment the Sentinel hardware resources. An RF Scanner GUI allows complete control of the system through a single interface. Start and stop frequencies of a scan can be set by the user as well as the resolution bandwidth. All user parameters can be saved as profiles for easy setup in the field. Frequency slices from the waterfall display can be selected and monitored, allowing the user to zoom into bands of interest. Threshold triggering levels can be set to record signals that exceed a specified energy. Recordings can also be manually started and stopped from the RF Scanner GUI. Please contact Pentek at 201-81-5900 or sales@pentek.com for more information on which Talon recorders can utilize the Sentinel software.